“A tree house, a free house, a secret you and me house.” The sixth season of the Treehouse Masters TV show premieres on Animal Planet, Friday, July 1, 2016, at 10:00pm ET/PT, with eight new episodes. The series stars Pete Nelson. Get all the details from this Animal Planet press release. (New York, NY) Animal Planet’s hit series, TREEHOUSE MASTERS, returns with eight all-new episodes premiering Friday, July 1st at 10PM ET/PT as tree whisperer Pete Nelson and his team of expert craftsmen build spectacular sanctuaries in the skies that continue to amaze and delight. From building an adventure headquarters for Pete’s globe-trotting friends in Washington State, to a French-inspired restaurant that allows customers to dine in the treetops of Texas, to a whimsical Swiss Family Robinson inspired treehouse getaway in Michigan, the latest season of TREEHOUSE MASTERS brings on new and exciting build challenges for Pete and his team. The crew also takes on their biggest treehouse to date when Grammy Award-winning artist Zac Brown enlists their help to construct a country-rock treehouse for Brown’s passion project, Camp Southern Ground, located in Georgia. In the premiere episode, Treehouse Point 2.0!, Pete and his family gear up to expand their treehouse empire on 23-acres of forest wonderland with a new Washington resort and spa that will entice visitors to experience arboreal magic. Diving into this family dream, Pete looks to his son Charlie to oversee the project as construction of the next addition to Treehouse Point kicks off and builds an incredible treehouse homebase for him to live in fulltime. Often described as a tree whisperer by his clients, colleagues and contemporaries, Pete Nelson dedicates his life granting people’s dreams of turning peaceful nooks in nature into the ultimate escapes. In TREEHOUSE MASTERS, Nelson and his team execute the most outrageous treehouses designed to delight every whimsy, form and function. 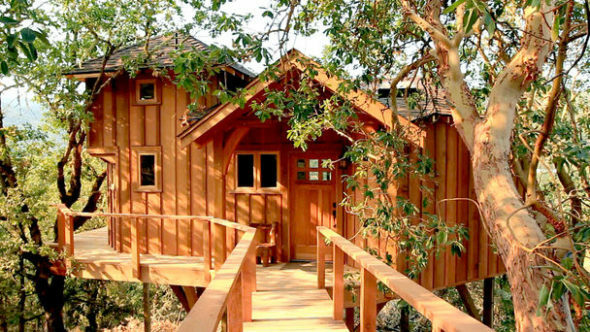 Whether he’s contriving magnificent multi-bedroom treehouses with state-of-the-art kitchens and bathrooms or rendering simpler, peaceful one-room escapes, Nelson always goes out on a limb to create the most breathtaking treehouses with spectacular vistas. What do you think? Are you a fan of the Treehouse Masters TV series? Do you plan to check out the sixth season on Animal Planet? More about: Animal Planet TV shows: canceled or renewed?, Treehouse Masters, Treehouse Masters: canceled or renewed? Please bring back the show treehouse master!